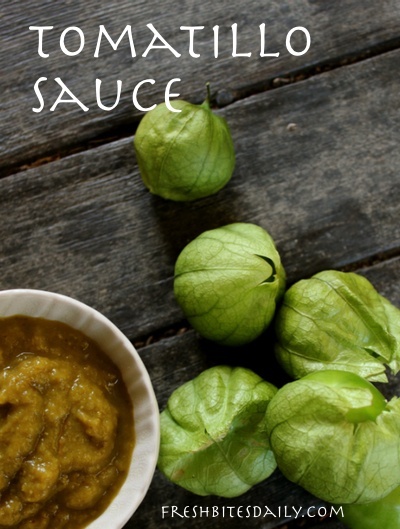 If you are fortunate enough to grow your own tomatillos or have access to a Mexican grocery, here is a delectable sauce to make a staple in your menu planning. It can be used as a base for soups, salsas and sauces. Be creative. Watch our tomatillo sauce video below or follow the written instructions. For salsa, add some minced hot pepper and minced fresh cilantro. Be bold in playing with this. Different peppers, green onions, fresh garlic – add things you generally like in your salsa. Green salsa traditionally has green ingredients, but you do not need to be limited. Add one cup of crushed hulled pumpkin seed to three cups of sauce. Pour over a large skilled of fried zucchini. Toss well and cover with grated Colby jack cheese. Melt the cheese and enjoy. 6 Comments on "Tomatillo sauce: Use and preserve your summer bounty with this tasty sauce"
Thanks for this, Amanda. I’ve read about tomatilloes in vegetarian cookbooks but I’ve never seen or tasted one. I’m jealous! to visit and link to each week!